And finally I get to sit at my computer and write! It's been an age, I apologise, I'd meant to be here well before now but then real life kicks in and you're on a roller-coaster that leaves just enough time for sleep and marathon ironing sessions (I'm guessing I'm not alone). Anyway, how are things with you? Are you celebrating Halloween or Samhain? This year we were given a packet of giant pumpkin seeds and after a couple of false starts managed to grow 3 enormous pumpkins. If you've never tried I can thoroughly recommend growing them for the entertainment value. They grow so fast you can practically see them spread across the garden. Our plants also kindly took off across the lawn, so we haven't mowed it since mid August - result! 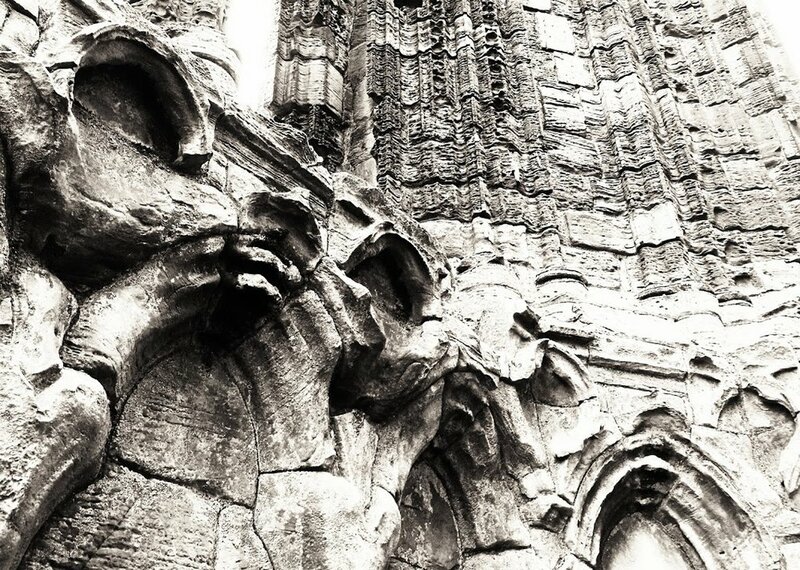 As it's nearly Halloween and there's been everything Dracula on the radio lately I thought I'd show you a few of the pictures I took in Whitby back in August. 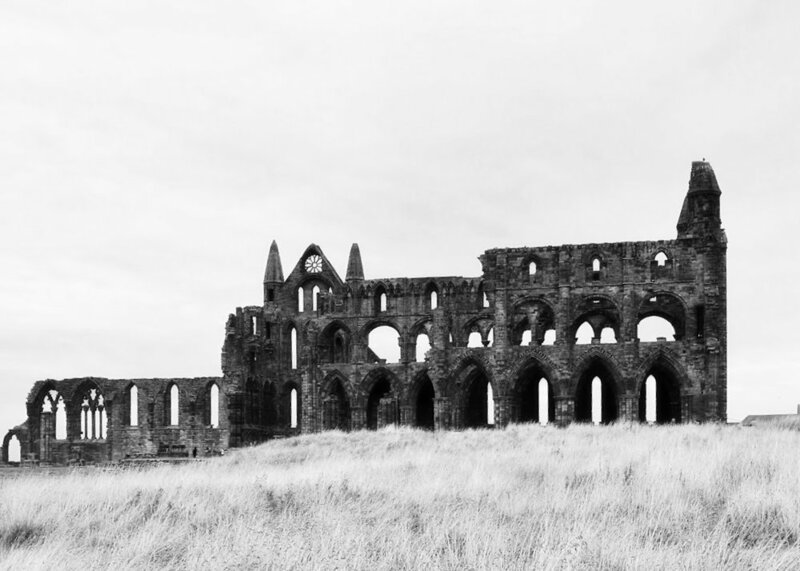 The Abbey is wonderfully atmospheric whatever your gothic desires, it's easy to see how it inspires people. I particularly love the eroded stone work, the arches look like sinuous fingers to me. I love Whitby. It's a town with fantastic character, great pubs and excellent fish and chips. If I was Dracula I might well have come ashore there too. It's been a wonderful three weeks so far at The Workhouse in Dunstable. For the next couple of months you can find me there on Wednesdays and Fridays. I've learned - or should I say I've re-learned - the lesson that art is in the eye of the beholder. It's a fabulous gift to sit and watch people's reaction to the art as they walk around and to listen to their comments. It is a fact that what one loves another won't, but there is someone who will connect with your work. I have heard people look at the same work and dismiss it, while others give the identical work high praise. So it is, and for us artists it's a lesson to keep front of mind. Make what you are called to make, don't worry about who's going to want it. The right people will find you. I've been on a mini-jaunt to Wales. I'll try very hard to post photos before I am called back to the laundry heap. We visited Tretower Court, Hay on Wye, Llanthony Priory, Raglan Castle, and Goodrich Castle - all my favourite places and only slightly diminished by me having a grim and evil tummy bug which denied me the excellent breakfast at the hotel - arrrgh! I've finished stitching another piece - hurray! But I haven't taken any decent pictures yet, so that will have to go on the 'To Do' list too. And lastly, I've done something I've never done before - I've had a small number of my photographs printed and framed for sale at The Workhouse in November for the 'Mist & Mystery' exhibition. I will definitely show you those too. Photography is the the way I capture the essence of the seasons as I make my daily walks along the lane and through the field and woods, it's become so much a part of what I do I hadn't stopped to look at it as another art form. This week I was prompted to go back and consider them with a view to showing a selection and I have to say it's made me quite excited, they've printed up so well. Have a good Halloween if you're celebrating. I'll be lighting a few candles and having a quiet contemplation. Reflection has gone out of fashion, but I find the wheel of the year, the cycle of life and the rhythms of the seasons keep me grounded and somehow deeply reassured.